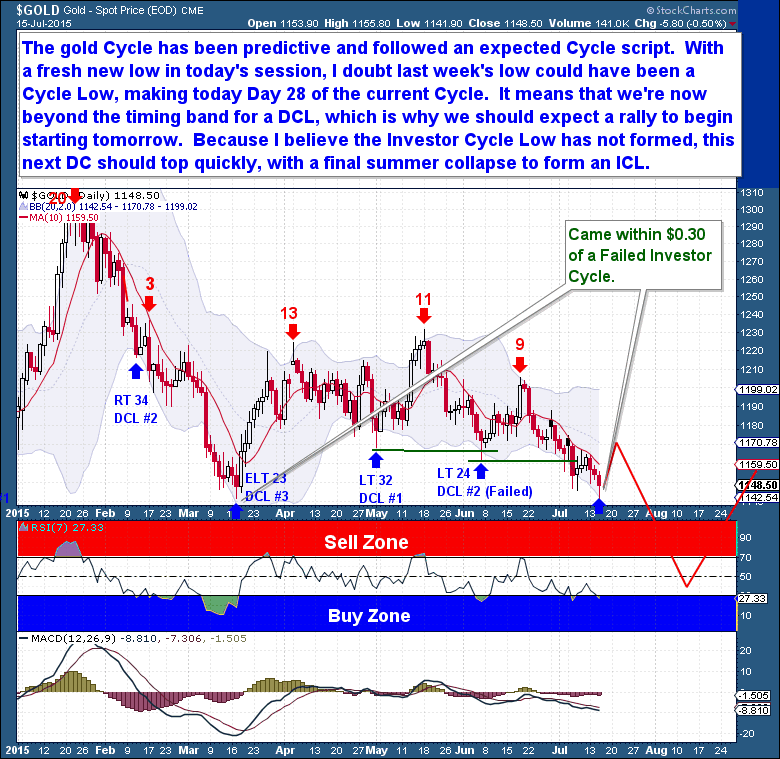 One thing is for certain, the gold Cycle has been very predictive and did follow the expected Cycle script for a Left Translated Investor Cycle. This has allowed us to predict the make-up and structure of the Daily Cycles, resulting in some good short positions, and to profit from the clarity these Cycles have afforded us. Today was yet another bearish day for gold, as the metal dropped to form fresh new lows for the Daily and Investor Cycle. Because of this development today, and the lack of a bounce recently, I doubt that last week’s low could have been a Daily Cycle Low. With today marking Day 28 of the current Cycle, it means that we’re now into and actually beyond the normal timing band for a DCL. That makes todays drop a strong DCL candidate and a reason why we should expect a rally to begin as early as tomorrow. But what of the Investor Cycle. Sure, there is now evidence to support an ICL. Miners, Silver and Platinum already failed, but gold continues to hold on, missing an IC failure today by just $0.40. COT is now bullish and sentiment in the gutter, reasons to support a new Weekly Cycle along with the next DCL. But as I’ve consistently reported, bear markets are about downwards pressure and surprises, which means we must take a bearish framework and outlook. Because I believe the Investor Cycle Low has not formed and the weekly Cycle count is still relatively young, this next DC should top quickly. This would coincide with a summer equity market rally, meaning for gold we will see a final summer collapse to form an ICL.